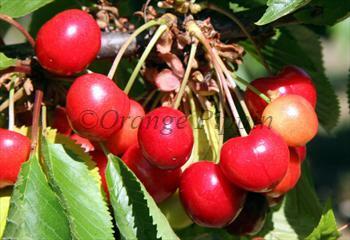 Skeena ripens later than most cherries, and is good choice for extending the sweet cherry season into early August. The fruit is also larger than most cherry varieties. Skeena® is a protected variety. Please fill in the details below and we will let you know when Skeena cherry trees are back in stock. A good substitute for Skeena - it has a similar parentage and shares many of its qualities. 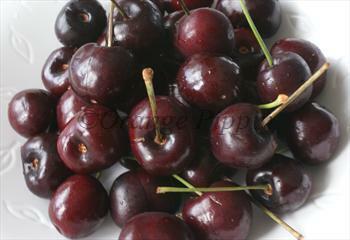 A self-fertile white-fleshed cherry with an excellent flavour - a good alternative to Skeena. Blossom wilt / Brown rot: Very susceptible? Skeena is in flowering group 3. Skeena is self-fertile and does not need a pollination partner, although fruiting may be improved if there is a compatible tree of a different variety nearby. Since it flowers in the middle of the blossom season it can be pollinated by most other cherry trees. Skeena was developed for commercial growers, so it is easy to manage and fruits heavily from a young age. Skeena is a bit susceptible to fruit-cracking and brown rot - the two often go hand in hand, and are caused by rain at harvest time. Whilst this has limited its appeal to commercial growers, it is unlikely to be an issue for the gardener or community orchard. Skeena was developed at the Summerland research station in British Columbia, Canada, during the 1990s, and released to commercial growers in 2005. The immediate parents were two unnamed research varieties, but Skeena is descended from Stella, Van, and Bing, and is very similar in flavour to Sunburst (which has a similar parentage).